This book leaves off just where the last one leaves off. Fiore (Katherine) has just jumped off the waterfall to get away from Monster (Arsen). When she wakes up she is the bed that she ran away from. He has chained her just like he did when he first bought her. The only way to get the chain off her is if she agrees to sign the papers. Fiore is starting to feel a lot more that the hate and the fear that she was feeling for Monster. Is this the start of something more? Fiore has o make that toughest decision of her life. What is she going to do? 5.0 out of 5 starsThis series is Exceptional !!! WOW this series is absolutely fantastic and can’t wait for Cherish !! Monster (Arsen) and Fiore (Katherine) are wondering what these feelings are that they keep feeling for one another. Monster is giving Fiore a present and then she has to decide what she is going to do but her mind keeps telling her to be on her guard. I wanted to scream at the end but I will have to wait for Cherish to come. I received a free copy of this boo through bookfunnel for a review. I'm totally enjoying reading this series. I started off expecting the usual Mafia inspired novel, but these books have an extremely good story line or 3..! 5.0 out of 5 starsYeah, That's The Stuff! Olivia Ryan has thrown down the gauntlet of intensity! The third book in the dark, captivatingly twisted, supremely heat inducing and suspenseful Cherish Series, I could feel the dark and confusing emotions swirling throughout this one! Bring it on! Monster and Fiore's complicated lives take them to new and raw heights, neither knows what to do with. Especially when families start putting ideas into their heads- sometimes ones they have no control over. Crime pays, especially when you are the most significant player in the high stakes game- Fiore finds out just how much she is worth in the game.. or does she? If they both make it out the other side of this one intact, it will be a miracle. Must be read in order starting with book one 'Capture' to understand- but if you like dark, raw, dirty, makes you feel all sorts of ways stories then THIS is a Series you must check out for yourself! Wow--what a cliffhanger! If I could, I would rate this a 5++. Riveting, action-packed and suspenseful! This Mafia romance was impossible to put down, and it will have you on the edge of your seat while leaving you intrigued and speculating what’s next, but it is jaw-dropping good! This book is one hot as hell, intriguing and twisted dark romance! It is dark with gritty gruesome details; murder, mystery, drama, intrigue, suspense, Mafia, and kidnapping continue to keep you glued to the pages of this fascinating story—it has an unexpected surprise in which I was holding my breath. This was an awesome book, in fact the series is awesome, one you NEED to READ—you won’t regret it, but you will need to read the series—this is not a standalone! Fiore (Katherine) survived a dreadful fate, and she was saved by the devil himself—Monster (Arsen). Now, Monster has waited long enough to claim her body, soul, and everything. He gets Fiore to sign a document, which gives him complete ownership. It doesn’t take Monster long to draw Fiore into his web, humiliating her, punishing her, charming her into his bed, and trapping her in his life. Now, Fiore and Monster are making headways—he takes her back to New Orleans. Can’t wait to read about Fiore and Monster’s journey and how it unfolds. I am quite sure there will be a lot of surprises and trying to figure out what will happen next. Can’t wait to read the next book! 5.0 out of 5 starsSuch an awesome read! Monster is pure evil. He terrorizes Kat. He humiliates her. He does horrible things to her. And then he's so sweet. And she does nothing to stop it. I think she kind of enjoys it. But her tears and fear might say differently. This book is really getting good. I was starting to believe that Olivia Ryann hates Katherine. All the torment she's going through. I want to hate Monster but I feel that he's turning. He had a moment of clarity and it is so obvious that he's falling in love with Katherine. But he's fighting it every step of the way. I can see it especially when he talks to his brother. Oh and the bodyguard. He wants to make sure no one touches Kat. This is such an awesome read. I am really enjoying this series. Covet picked up beautifully where Control left off. Arsen and Fiore (also known as Katherine) are as hot as ever in book 3 of the Cherish Series. 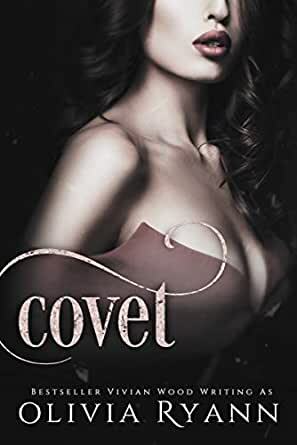 I find that Covet is a book all about choices. Not only does Arsen allow Fiore to make everyday choices like decorating a house or buying clothes, but he also gives her the ability to make huge life choices that not only affect her but others lives as well. Arsen also makes big choices in this book. As the story unfolds, we see that they are growing to be more like a couple and less like a captor/captive. I love the progression of these books and I can't wait for the next part. Yes they are a little dark but there is dark in real life as well.